New York Times bestselling author and neuroscientist Daniel J. Levitin shifts his keen insights from your brain on music to your brain in a sea of details. The information age is drowning us with an unprecedented deluge of data. At the same time, we're expected to make more--and faster--decisions about our lives than ever before. No wonder, then, that the average American reports frequently losing car keys or reading glasses, missing appointments, and feeling worn out by the effort required just to keep up. But somehow some people become quite accomplished at managing information flow. In The Organized Mind, Daniel J. Levitin, PhD, uses the latest brain science to demonstrate how those people excel--and how readers can use their methods to regain a sense of mastery over the way they organize their homes, workplaces, and time. With lively, entertaining chapters on everything from the kitchen junk drawer to health care to executive office workflow, Levitin reveals how new research into the cognitive neuroscience of attention and memory can be applied to the challenges of our daily lives. This Is Your Brain on Music showed how to better play and appreciate music through an understanding of how the brain works. 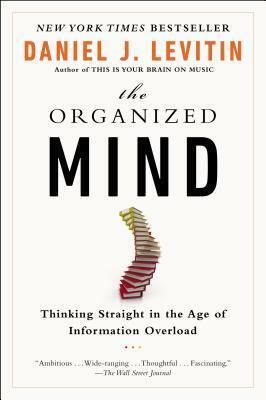 The Organized Mind shows how to navigate the churning flood of information in the twenty-first century with the same neuroscientific perspective.